Strange Carolinas In Our State Magazine! Back in January, we received an email from someone at Our State magazine. They requested permission to use one of our photographs, the one at the top of our piece on the miniature Friedens Lutheran Church, in their magazine. So we sent them a high-res version of the photo. Today, our copy of the issue came in the mail. 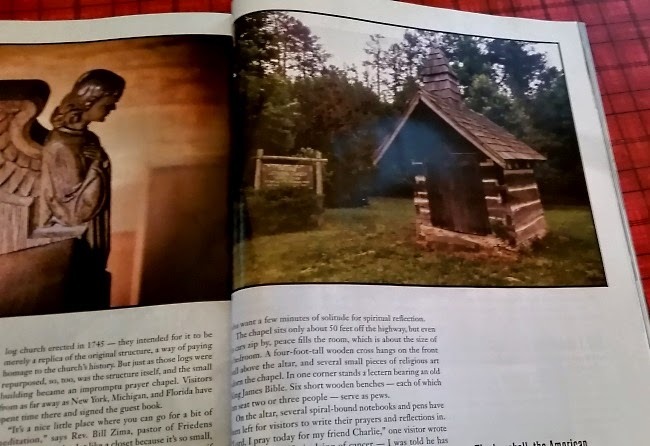 And sure enough, on page 171, in Jimmy Tomlin's "Small Space, Large Presence" story, you'll see our photo!